As we approach the busiest air travel day of the year, we at the Ithaca Tompkins Regional Airport (ITH) would like to take the time to acknowledge what we’re most thankful for – all of you! As a small show of our gratitude for our incredible community, we will be hosting our third annual customer appreciation event from now through Wednesday, November 21. We really enjoy getting to meet with our customers and learning more about the community that flies in and out of the airport. We are especially grateful for your unflagging support that has propelled us toward our $24.7 million construction project. The changes you see in and around the terminal are, in large, thanks to all of you. 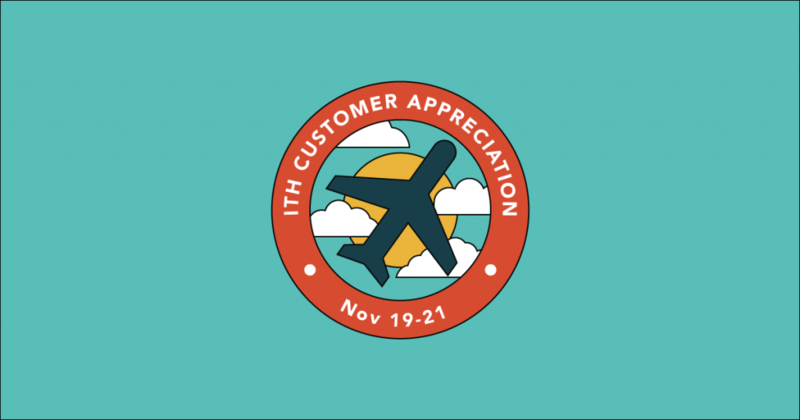 So, as you are zipping through the airport on your way to your Thanksgiving destination, stop by the customer appreciation table to say hello and snag a few ITH swag items. To make sure you make it to your Turkey Day festivities on time, don’t forget to allow yourself extra travel time to grab some swag and to navigate the changes in the terminal. As a reminder, baggage check-in has been relocated to the west wing of the airport terminal, next to the baggage claim area. If you have any questions about where to go, or just want to chat with any member of the airport team, look for anyone wearing a “We’re wITH You” pin – we will be more than happy to assist you! We appreciate each and every one of you who has chosen to make ITH a part of their Thanksgiving travel plans this year. Thank you for flying ITH!